Khenpo Achö (Tib. མཁན་པོ་ཨ་ཆོས་, Wyl. mkhan po a chos) (1918–1998) aka Khenpo Chöying Rangdrol came from the famous Lumorap monastery in Nyarong, which is closely associated with the great Nyingma foundation of Mindroling in Central Tibet. He had many disciples in the area around Tromgé, Nyarong, and Kandzé. Khenpo Achö was recognised by Dudjom Rinpoche as a reincarnation of Khye'u Chung Lotsawa. Dudjom Rinpoche gave him Dzogchen teachings and made him the chödak of his terma of Vajrakilaya Pudri Rekpung 'The Razor That Destroys at a Touch'. "In 1956, Dudjom Rinpoche was bestowing the Rinchen Terdzö at Samyé Monastery in Tibet to a mass gathering of Sangha. Chagdud Tulku Rinpoche, who was on a personal pilgrimage, happened to arrive at Samye just as Dudjom Rinpoche was beginning the transmission. During one of the breaks between the empowerment sessions, Chagdud Tulku Rinpoche approached Dudjom Rinpoche’s throne and offered him a long blue kathak. 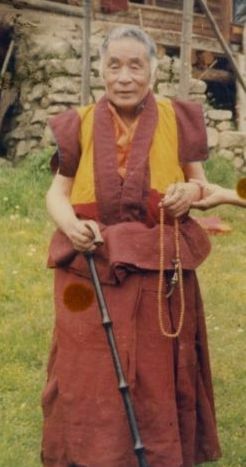 Upon being asked who he was, Chagdud Tulku Rinpoche explained he was Chagdud Tulku of Chagdud Gonpa, and also the son of Delog Dawa Drolma. Dudjom Rinpoche knew Dawa Drolma and he invited Chagdud Tulku Rinpoche to a meeting later that night, when he told Chagdud Tulku Rinpoche that there was a great yogi from Nyarong (eastern Tibet) in the vicinity. Dudjom Rinpoche requested that him bring the yogi to Samyé, which Chagdud Tulku Rinpoche then did. This yogi was Khenpo Achö. When Khenpo Achö arrived at Samyé, Dudjom Rinpoche was then transmitting his own Vajrakilaya treasure, the Pudri Rekpung, to the Sangha gathered there. There were many high lamas from around Tibet present, but to their surprise, Dudjom Rinpoche made Khenpo Achö sit on the highest seat in the assembly. Dudjom Rinpoche then empowered Khenpo Achö as Chödak for the Dudjom Vajrakilaya Pudri Rekpung, telling him to keep Vajrakilaya as his heart practice and to uphold this commitment for his life. Khenpo Achö returned to Lumorap monastery in Nyarong and entered into retreat for most of the rest of his life. While in retreat he wrote an extensive commentary on the Dudjom Vajrakilaya Pudri Rekpung practice". Khenpo Achö attained the rainbow body on a hillside above Lumorap in September 1998. Apart from reports in the regional press, this was the subject of an article, “The Rainbow Body,” in Institute of Noetic Sciences Review 59 (March–May 2002); it was also mentioned by Matthew T. Kapstein in The Presence of Light: Divine Radiance and Religious Experience (University of Chicago Press, 2004). "Recently, on August 29, 1998, at Dome Khamngak in Azi Rong in Tibet, Khenpo Achö, eighty years of age, attained physical dissolution. One day at noon, lying in bed, without having suffered any recent illness, while in the posture of a sleeping lion and reciting he six-syllables mantra, he attained buddha in the primordial basic matrix of alpha-purity, his heart of clear light reality perfected beyond the intellect. As his body dissolved into light, his wrinkles vanishing, he seemed like an eight-years old child with a beautiful complexion. After a week had passed, when people came to know of his death, they performed his death puja secretely in order to deceive the authorities, and at that time, rainbows appeared inside and outside, and a pleasant aroma pervaded the place. His body gradually diminished in size, and at the end, he attained buddha; not even his nails and hair were left behind. It was just like a bird flying from a rock— people nearby have no idea where it might have gone'. ↑ His Gelug name was Gelong Lobsang Khyentse. ↑ Presentation of a Vajrakilaya Drupchen on Chagdud Gompa Brazil. ↑ Tulku Pema Rigtsal, The Great Secret of Mind, Snow Lion, 2012, page 232. This page was last edited on 8 December 2017, at 21:49.